Autosport International at the NEC in Birmingham is traditionally the first event on the British motorsport calendar, a chance to get up close to the upcoming seasons cars and generally break up the boring off season. 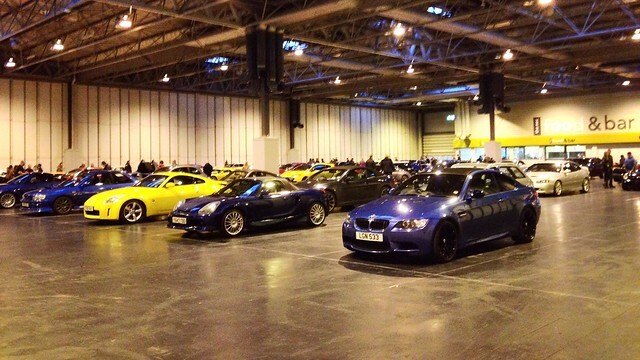 For 2014 there was the added bonus of a Pistonheads Sunday Service event before the doors to the show opened, and free indoor parking! As always, the standard of cars at the Sunday Service was high, with everything from my MR2 to a Porsche GT2. Some people had even braved the freezing temperatures to arrive in Caterham 7s. However, my star of the PHSS was the yellow Nissan 350Z GT4 special edition, shown in the picture above – now a serious contender for my next car. After a bacon and egg roll at the cafe the NEC had opened just for the Pistonheads event, it was time to go through to the show. The layout was pretty much the same as it has been since the ’90s when I went as a child, but the Performance Car Show part of it seems to have got bigger, with a lot of manufacturer presence. Tucked away in the corner between the Performance Car Show and the motorsport stands was an iterating display of cars and bikes raced by John Surtees. The F1 cars of the late ’60s are to me the most exciting despite their simplicity – I would have loved to see them racing in their day. Nearby the 2013 field of F1 cars were on display, I found it interesting to look at the details of the Red Bull F1 car, especially the rear, somehow it all looked a lot neater than the other cars, neat must equal quick (although I still prefer the earlier cars). I felt that the Live Action Arena had too much talking and not enough live action, but once again I was impressed by the Autograss racers, as I didn’t already have a new years resolution I have made it my resolution to go to some of their meetings this year and picked up their calendar. I had an interesting chat with an engineer from Caterham about the digital dash screens they are developing for their cars, this is of particular interest to me as infotainment screens in cars is my day day job and Caterham are one of the last companies I would expect to be developing screens. The car which grabbed my attention the most was the Zenos E10, a small track day car, built by a company based over the road from Lotus. The attention to detail on the E10 was really impressive, the car seems to have been designed by petrol heads, for petrol heads without too much interference from marketing or money men – a refreshing change and I wish them good luck. This entry was posted in Motorsport and tagged Autosport, iPhone, Photo by Lewis. Bookmark the permalink.